I am still having fun with oils, Except for the horrendous messes that I am making. I just finished cleaning all my brushes and then dropped them on my palette. What a mess. I love that with oils I can continue to make changes until I am happy with a painting. This painting requires a lot more work but I am happy with the start. I still have a ways to go with this but it is getting closer. I now have oil paint on one of my ski gloves, seat belt, coat and jeans. I am having a blast but it sure is messy. I spend as much time cleaning up as painting but it is worth it. Today was my first time painting outdoors with oils. It was -2 C and alternating between snow and sleet and I was grinning from ear to ear the whole time. The winter marsh was alive with colour. The cool greys in the background, the yellows of the willows, the brilliant red of the dogwoods and here and there patches of glowing white snow. I started out painting as I would with watercolours, and struggled a bit, but once I realized how easy it was to go back in and punch up the highlights or make a tree skinnier I started having a blast. This may not be a great painting but I am really excited about it. I was told twice today that I have found my medium. I am certainly enjoying working with it. Oopsie! I had to do some repairs. It seems I thinned some of my paint too much and it all started to run down the canvas. It is now laying flat until it dries. My brother-in-law is struggling with his health right now and we are all worried about him. I have always found painting good therapy so I headed to my studio. This is another small one and I find them more difficult to paint. I really struggled with this and I am not very happy with it but looking back I realized that the whole time that I was painting I was thinking of Bill in the hospital instead of on the golf course or in his boat fishing. If I was focused on all the great times we have had the painting probably would have come easier. It definitely needs less grey and more happy colour. A Very Good Friend of Mine 11" X 14"
For years people have been telling me that oils are way easier than watercolours and until now I never believed them. They aren't exactly easier but they are much more forgiving. I always balked at oils because of the solvents and the messy job of cleaning brushes. I have discovered that vegetable oil and brush soap works fine for cleaning brushes and I thin my paint with walnut oil so no solvents are required. This still needs a fair but of tweeking but it is were I managed to get to today. Guennadi suggested that a good way to learn to paint was to copy a painting by a favourite artist. This Tom Thomson painting would have been easier to copy if I had one of his boards and his pigments but I didn't so I toned a canvas light brown and agonized over matching his colours. 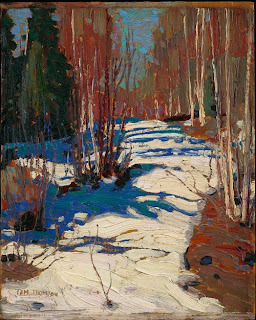 As it turns out there is a much to be learned by attempting to copy a painting by another artist and when that artist is Tom Thomson it is easy to learn because I can see all his brush strokes. In the process of copying his painting I was constantly trying to analyze why he chose the colours he did and why he put strokes of paint where he did. 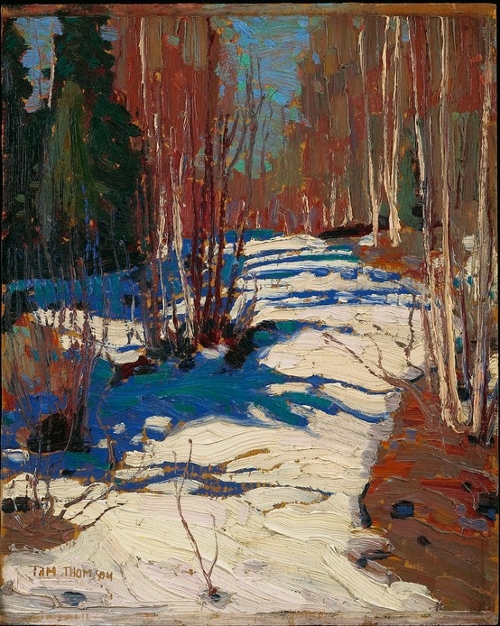 I also became acutely aware of how he used his background colours to tint the snow which gave a sense of unity to the painting. My trees need to be less perfect lines and more broken up but hey I am proud of this anyway. The top painting is mine and the bottom one Tom's, My colours are closer to his than this looks. I am loving oil painting.